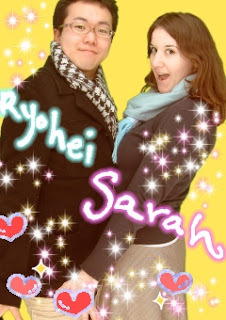 Wow.. it doesn’t seem real but Ryohei and made it official today!! We handed in our papers at the ward office and are now man and wife.. it really hasn’t hit me at all. Anyways it was a pretty short and easy experience, I’ll write about it when I have more time tommorrow. 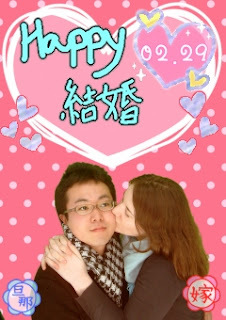 We took some purikura to celebrate! Here are our fave shots! busy with work and other social engagements has helped. we eventually ended up back together. it I feel so empty and want to cry. My supermarket was selling pineapples for 99 yen this evening so I bought one and split it with Ryohei! It was so yummy! I love pineapples, and since fruit is so expensive here we hardly get to eat it! This week is really busy for me! My supervisor overheard this and was pretty angry and told me to ignore him, and that he was the type of person who believed that foreigners shouldn’t or couldn’t speak fluent Japanese, and that he was a little odd. It didn’t bother me too much, but we have to see that group again next Wednesday… the guy just kept staring at me and listening in on my conversations.. it was so ackward. 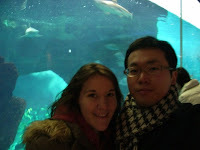 Ryohei and I went to the aquarium on a date Saturday! 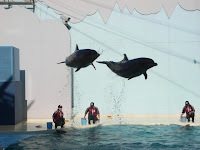 It as pretty fun, they had a great dolphin show, made me a little nostalgic for Sea World back home.. oh well in exactly a month I’ll be back on American soil!! My first time in over a year and a half!! I’m so excited, I just wish Ryohei would have been able to come and meet my family. has seemed pretty tame in comparison. work and school and I end up crying before coming up to work. Its not hard to make me cry actually.. I tend to get really vulnerable and sad if I feel like someone is attacking me. As opposed to fight or flight.. I’m more of “freeze” as in just stand there with nothing to do but wipe my tears of frustration while at the same time wishing with all my might the other person wasn’t upset. I guess that I was wrong in what I said, but it was just in jest.. things are fine now. They usually are when we’ve put a little space in between us. We met up for lunch and without really saying a thing about the earlier incident, we got over it. Sometimes you just have to let it go.. I used to always bring problems up until I felt like they were fixed but sometimes I think its not so much about what was said as just give expression to feelings. Like I said in my last post, we are both in a temporary place delicately walking on a tightrope, trying to balance with eachother and the various frustrations that life has thrown at us. I think the first month was very happy, we were finally together after a long 9 months of seperation and him moving in was probably was the only way that we could have ended up being together… but now its much more difficult than I expected. To be brutally honest.. its not really me, its him. He has no money since he spend most of his savings on his school to study for a test which we are praying he will pass but who knows maybe he wont… and then what.. I think its the one thing that neither of us want to think about it. year. I know that the decision was ultimately his, and I should be glad that he picked me over his old job, but part of me feels that until he has passed his test and been secured a job in Niigata, part of him is a little resentful that I took away his security only to leave him financially stripped and dependent on me for his next meal. I guess that would make most men cranky. If only this would be over soon… but I know that it will be July or August before we have a better idea of where this will be heading. This was a crazy weekend for me..
have my coworker, Mr. O interact more with my friend Ana, and they seemed to hit it off again, so I’m happy about that. wearing the same outfits to work each week.. its a little bit embarrasing. One of my goals when I go back home next month is to pick up lots and lots of clothes. check until this phase in my life in completed. as long as I am at my job it is the most affordable option. different reasons but because they both seem in control of their life..
housewife in japan raising her son; one for coming out here finding a job and living independantly without any assistance.. I just really want to feel unbound, and maybe by leaving Kobe and starting “from scratch” in Niigata will finally allow me to feel fin control of the direction my life is going. So, my mail had been forwarded to the person who used to live in my apartment. Fortunately he still lives in Kobe and we have a mutual friend so I was able to get in touch with him. He has the letter from Ryohei’s mom and my JLPT results. Anyways I asked him to tell me and he said that I passed JLPT 1kyuu!! I don’t have the exact numbers but when I get the actual sheet from my friend next week I’ll post them here! I put in a lot of time studying for the test so I’m just happy my efforts were rewarded. So now I can look for another goal.. no idea what it will be at this time. I always feel like I need to have something to work towards..
What the heck? Part 2 WTF Japan!?! Ok so.. the story from below.. it continues in a wonder fashion. So today would be the 5th day that my test results and registered mail from Tokyo have not been delivered. Definitely weird. So I decided not to wait any longer and called the senders of the mail from Tokyo asking if I could get the number of the letter they were sending me. The man was very polite and told me to wait 10 mins or so before calling back and telling me that the letter had been sent to my local post office and then sent back because apparently I don’t live at my address anymore. He tells me I should get in contact with the post office immediately. I then realize something.. Ryohei moved in with me a about a month ago, and he registered himself at the local office. When you register, you get a jyuuminhyo or your proof of living there I guess.. but anyways since many of those married to Japanese will know, gaijin are not put on these. Thus, when Ryohei had his created even though this is my house and I am registered here via my foreign resident card, I was deleted and he was put as the owner of the house. Thus the mail for him is constantly delivered, and the mail for me is being returned or sent to a forwarded address.. I am not sure which. I contacted the person who lived here before me asking him if my mail has been sent to him but no reply yet. So, that would explain why Ryohei’s moms letter (addressed to me), my test results, and obviously the registered letter from Tokyo have not come. They don’t think I live here any more because I’m not Japanese and thus not on the jyuuminhyo. So yah, I am pretty frustrated. Ryohei has called the post office and told them to put that I am living here. I guess they will be resending the package from Tokyo after the long weekend. And as for my test results.. if the guy who used to live here doesn’t have them they’ve been sent back to Tokyo. I spent 20 minutes on the phone with the testing agency, which of course knows whether I passed or failed but they won’t tell me over the phone because its “personal” information. And then they say, well if you want to send us 1000 yen for a certificate we can mail it to you, if not you’ll have to wait until the 19th when we can resend results. I’m so frustrated. I guess I’m just not going to know unless I decide to fork out 1000 yen just to find out that I failed… I’m so angry..
As for Ryohei’s moms letter.. no idea where that went.. perhaps back to Niigata perhaps to the guy who was here before me. Anyways this is the first time I’ve really felt like an outsider here, and it hurts. I hope the stupid post office puts me back on their list so that I can get my mail. I don’t know what to say I’m so frustrated and annoyed.